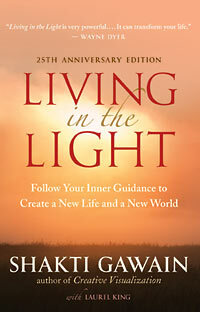 In the 25th Anniversary Edition of Living in the Light: Follow Your Inner Guidance to Create a New Life and a New World, beloved bestselling author and New World Library cofounder Shakti Gawain addresses these questions. Living in the Light has given millions of people clear and gentle guidance to create a new way of life — one in which we listen to our intuition and rely on it as a guiding force — and in these changing times in which we live, the book’s message is more important than ever. We hope you’ll enjoy this short excerpt from the book. To whatever degree you listen to and follow your intuition, you become a “creative channel” for the higher power of the universe. When you willingly follow where your creative energy leads, the higher power can come through you to manifest its creative work. When this happens, you will find yourself flowing with the energy, doing what you really want to do, and feeling the power of the universe moving through you to create or transform everything around you. In using the words creative channel, I am not referring to the psychic process of trance channeling. Trance channeling involves a medium who goes into a trance state and allows another being to speak through him or her. When I use the term channeling, I mean being in touch with and bringing through the wisdom and creativity of your own deepest source. Being a channel is being fully and freely yourself and consciously knowing that you are a vehicle for the creativity of the universe. Every creative genius has been a channel. Every masterwork has been created through the channeling process. Great works are not created by the personality alone. They arise from a deep inspiration on the universal level and are then expressed and brought into form through the individual personality. A person may have great technical skill, but without the ability to connect with a deeper source, his work will be uninspiring. The difference between a technician and a channel was clearly demonstrated in the movie Amadeus. The composer Salieri knew how to write music but he didn’t know how to tap into the creative source. Mozart wrote music that was both technically perfect and wonderfully inspired, and he did so easily, spontaneously, without thought or effort. From his early childhood on, music just seemed to bubble up and overflow from within him. I’m sure he had no idea how it happened and could not have explained to anyone else how to do it. Such genius has always seemed mysterious and unexplainable, a God-given talent possessed by only a few. It seems to come and go at will — sometimes it’s there, sometimes it’s not. Because of this, many creative people fear their talent will suddenly disappear. They don’t know how they got it so they have no idea how to recover it if it vanishes. Creative people often function as channels in only one area of their lives (such as one of the arts, science, or business) and may have no idea how to do it in other areas of their lives. Thus, their lives can be terribly out of balance. (See the section “Highly Intuitive People” in the chapter “Trusting Intuition.”) This is one reason that we often equate genius with emotional instability. I believe we are all geniuses — each in our own unique way. We will discover the nature of our particular genius when we stop trying to conform to our own or other people’s models, learn to be ourselves, and allow our natural channel to open. Through trusting and acting on our intuition, it’s possible to bring our natural creative inspiration into every moment, into every area of our lives. When I speak of a channel, I have an image of a long round pipe with energy flowing through it. It’s somewhat like the pipe in a pipe organ, with the music coming through. This channel image has three important features:It is open and unobstructed inside so that the energy can move through freely. It is open and unobstructed inside so that the energy can move through freely. It has a definite physical form; a structure surrounds the open space so that the energy is directed in a particular way. Without this structure, the energy would be free-floating, without any focus. It has a power source — something that moves energy through the channel. In a pipe organ, the power source (the organ) sends energy through the open pipes. The particular combination of open space inside each pipe and the structure — the size and shape of the pipe — causes a certain note to be sounded. The power source is the same for all the pipes and the energy moving through them is the same, but because each one is a different shape, each one makes a unique sound. We can think of ourselves as channels similar to these pipes. We have a common power source (the universal life force), and the same creative energy flows through each of us. Our body and personality form the structure that determines the unique direction and function of each of us as a channel. It is up to us to keep our channel open and clear and to build and maintain a strong, healthy, beautiful body/personality structure as a vehicle for our creative energy. We can do this by constantly tuning in, asking where the energy wants to go, and moving with it. A strong body/personality structure is not created by following anybody else’s rules or good ideas about what you should eat, how you should exercise, or anything else. It is created primarily by trusting your intuition and learning to follow its direction. When deciding what to eat, how to exercise, or anything else, gather information from reliable sources, then check in with yourself to see what feels intuitively right for you, and do your best to follow your own inner guidance.